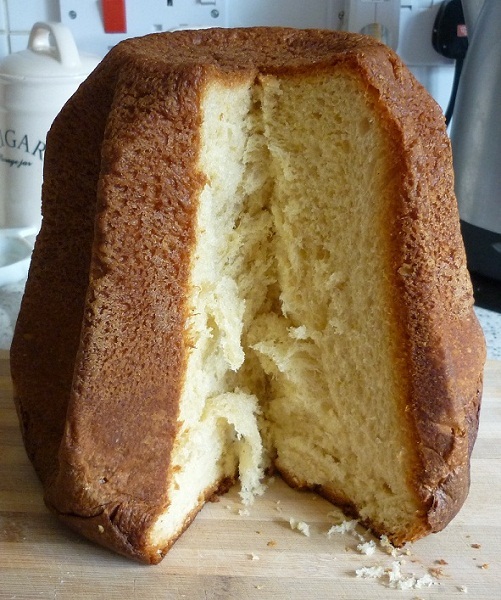 My first effort making Pandoro was a huge success! I will include my recipe as soon as I can. Lovely, even coloring of the crust and a "shreddable" crumb. Well done! This was my first post here on TFL! Thanks for welcoming me with your kind words..
Michael, it seems I lost something VERY remarkable! the crumb is incredible shreddable, good for a manual! Thanks Nico, that means a lot! I just need to make one like this but with natural yeast... All the recipes I've seen are rather complex! This one is for a non-laminated pandoro. In my opinion it's the best: richest in flavor and easy to handle. I made it substituting the yeast with some starter and it came out fantastic. Another time I made some changes: in the first dough I substituted the yeast with some firm starter accounting for 20% of the flour of the first dough. Even better result! Which recipe do you wish to follow. I'm happy to translate it for you if you wish.. But do you need instruction on how to mix and such? The formula, timings and temperatures are all I need to know now-a-days.